Borne by the breath of God to the Carmelite Monastery, Frances Nevins committed herself to be Sister Christine of the Holy Spirit, whatever the price of the call. The following is from: “ The Circular Letter”, sent by the Schenectady, New York Carmelites to the other 65 monasteries and to friends of the deceased. The identity of the author is unknown, in keeping with the Discalced Carmelite custom. 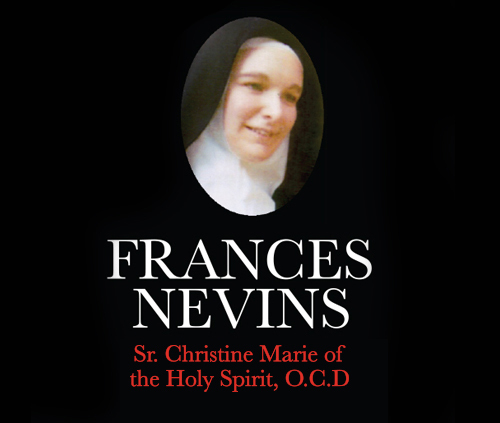 Sister Christine (Frances Nevins) was born in Springfield, Massachusetts on August 17, 1930, the daughter of a Catholic father and a Protestant mother. She was baptized a Catholic in infancy, but was brought up in the Protestant religion. When she was twelve years old, her father died. Her mother married again. As a child she was piously inclined, having an attraction for things of faith and religion. When she asked her mother about the Catholic Church (she knew her father had been a Catholic and that she had been baptized a Catholic), she was told that it made no difference which Church one attended. Thus the issue of her Catholic faith was evaded and eclipsed. After graduation from college, Frances began teaching. Through the associations made in her work, she met a young man to whom she became greatly attracted. His piety, uprightness and his interest and love of religion, (he had thought of studying to be a minister), found their complement in her. They were married and lived happily together for about a year and a half. During that time, in the course of a European tour they visited Rome and had an audience with the Holy Father. This event was the turning point in Frances’ life. She experienced a strong conviction that the Catholic Church was the only true Church. Thereupon she seriously investigated the matter; becoming more strongly convinced of its undeniable truth. In order to find out what was to be done that she might become a practicing Catholic, Frances went to the Jesuits for assistance. The outcome was, of course, that since she was a baptized Catholic, her marriage would have to be blessed by a priest and her husband must promise to bring their children up in the Catholic faith. This he absolutely refused to do, as he felt that no religion had the right to demand that they be “married again” and in conscience he felt that he could never promise to bring the children up as Catholics. Heaven is being with all those you love at the same time. Home of Frances Nevins. East Granby, CT 1947-1960. She was the holiest person I ever knew.